13 Dresses made for Christmas Boxes instructed by Maureen Jones in her new store "haute pare". Thanks to everyone who helped make last Sunday a wonderful day of giving at St. John’s! If you were unable to turn in your Financial Commitment Card during worship you may still do so by mailing it to the church office, dropping it off with Marjie or placing it in the offering plate next Sunday. Outreach Giving Cards were distributed at the luncheon following worship and those, too, can be mailed in, dropped off or placed in the offering plate. I was very inspired by our speakers at the luncheon. It was a blessing to hear about the wonderful work these agencies are involved in throughout Helena-West Helena. If you have not already done so, please prayerfully consider supporting one or more of these groups by completing an Outreach Giving Card. One hundred percent of funds received will go to the group or groups you designate on your card. All checks should be made out to St. John’s Church. We will handle distributing your gift to your designated recipients. Finally, thanks to all who turned in a UTO box last Sunday. I feel blessed to be part of a church that is so very generous in supporting those beyond our walls! LaQuenta Baker, of Helena, has been awarded a Helen G. Bonner Scholarship to Phillips Community College of the University of Arkansas-Helena. This award is a partial scholarship. A graduate of Central High School, Baker is currently pursuing a career in phlebotomy. The Bonner Scholarships were established by Ben Bonner in memory of his mother. These awards are designed to assist hard-working students and specifically target students who have shown potential. To qualify, applicants must have completed their course work at Phillips College with a cumulative grade point average of 2.5. Adult Sunday School: Meets Sunday at 9:00 am. Sunday School: Will meet at 9:00 am at the First United Methodist Church. Angels of Grace and Anchor Mission ministries: The items from their wish list this week is dish soap. Humane Society of the Delta: Donations needed are dog & puppy food. Their plastic tubs are on the stair landing by the chapel. Grace Food Pantry: plastic bags go in the labeled container in the narthex. Thank you for your weekly donations. They are all greatly appreciated. Operation Christmas Child (OCC) boxes are being packed and very near completion. ECW will accept monetary donations to complete the items needed for the boxes and to help with the $9.00 shipping cost for each box. Thank you for your support. 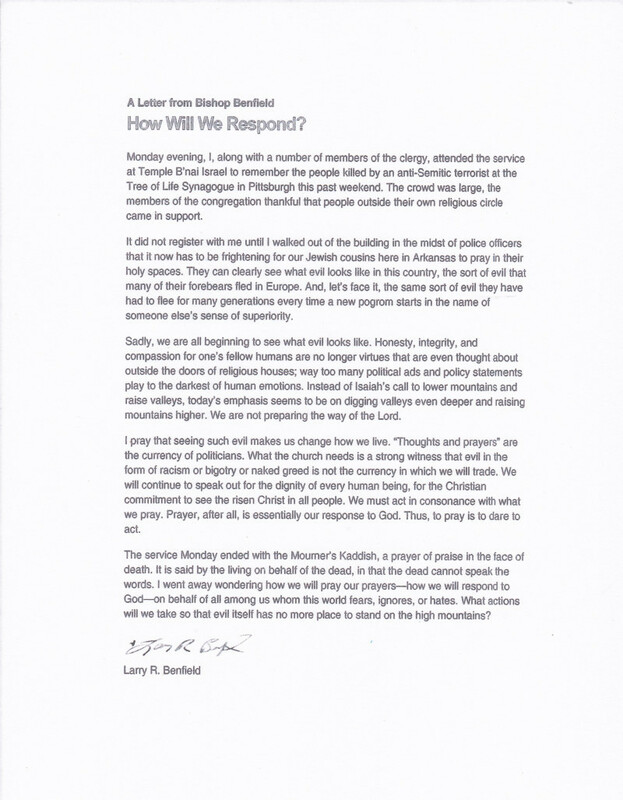 Letter from the Bishop is below. The website to purchase St John’s church photos is https://stjohnsepiscopalchurch.pixieset.com. All proceeds will go to support Young Life of Phillips County. Photographs can also be viewed in the church office. St. John’s T-shirts are available with sizes from S through 3XL. The price is $15. Street address: 625 Pecan St.